I don’t even need to pen anything because the picture pretty much says it all. How hot are these colors from COLOR CLUB?? So now! Let your tips welcome summer into your life with a Nail Lacquer from their Flower Power Amp’d Up Neon Shades collection. Choose from Lazer Pink, Orange Revenge, Screamin’ Fuchsia, Limelight, Pink Lust, or Power Play. My color pick so far this week is the Screamin' Fuchsia and it looks rockin' on my toes. It practically glows out in the sunlight! 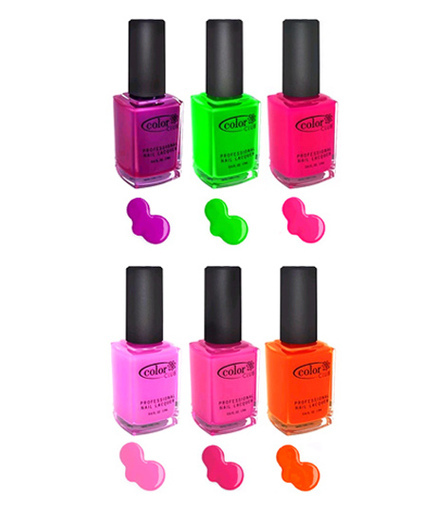 And if you buy this salon pack, they throw in their new Vivid Color Intensifying Top Coat. For some reason, the polish finish is very matte, so make sure to apply this Top Coat afterward. $8.50 @ colorclub.com.